The NBC investigative news operation has been running a series on allegations of voter fraud and the appearance of election observers, such as the True the Vote group, meant to police voter fraud. Like almost every news outlet that has examined the issue, News21 found “no evidence that photo ID laws are needed,” but that hasn’t stopped organizations like True the Vote from placing election monitors, many of them white, in voting districts, many of them populated largely by minorities. Demonstrators have decried the group, saying it is engaged in intimidation of minority voters. 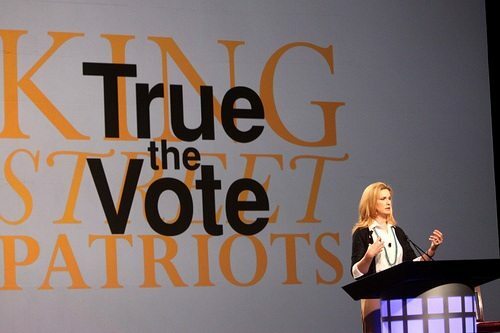 Founded by a Houston branch of the Tea Party movement called King Street Patriots, True the Vote has been sending election monitors around the nation into minority neighborhoods with the aim, according to founder Catherine Engelbrecht, of preventing voter fraud. True the Vote is fast-growing and effective. It is active in training poll watchers in 20 or more states and has been part of a movement promoting voter ID laws that have been considered in 37 state legislatures. Engelbrecht says she wants to train and place 1,000,000 poll watchers around the nation to monitor the national elections this fall. True the Vote won’t be alone. Its poll watchers will themselves be watched by representatives of labor and civil rights groups, such as the NAACP and the National Council of La Raza, who believe, according to Eddie Hailes of the Advancement Project, that groups like True the Vote “exaggerate claims of voter impersonation in order to organize efforts that can lead to intimidation of eligible voters.” King Street Patriots and True the Vote have encountered a few problems themselves, including a state ethics complaint in Texas and charges that they were making illegal contributions to Republican Party candidates. True the Vote is no fly-by-night organization. Engelbrecht has recruited top flight talent for the organization’s advisors, including former Justice Department lawyer J. Christian Adams, the Heritage Foundation’s Hans von Spakovsky, also a former Justice Department lawyer and a former member of the Federal Election Commission (as well as a co-author on the new book Who’s Counting? How Fraudsters and Bureaucrats Put Your Vote at Risk), and James Bopp, who was part of the legal team on the Citizens United case. What should one make of True the Vote, given the allegations of voter fraud and voter intimidation? Although True the Vote professes to be free of racial bias, its white election monitors are often placed in minority voting districts. According to Nic Riley of the Brennan Center at New York University, “In a community where voter participation is not very high and where folks are not as politically active, any barrier that prevents you from getting to the polls or that discourages you from getting to the polls is potentially a problem.” A quick look at the True the Vote website reveals that this group is not a tiny offshoot of a local Tea Party group but, rather, one serious organization. Writing for Colorlines, Brentin Mock offers an impressive analysis of True the Vote, showing its reach and influence among conservative political activists, with the Houston Tea Party (King Street Patriots) as the 501(c)(4) and True the Vote as the 501(c)(3) arms of a sophisticated operation. There is money coming into this operation, but like most tax-exempts, we won’t know how much until they file their Form 990s well after the election—and given confidentiality laws, we won’t know where the money really came from unless Engelbrecht and her colleagues choose to tell and, so far, they have declined to do so.